I have an excuse, albeit possibly a feeble one, for the recent lack of posts. The day job took me back to Michigan again during the second week of December and after that I was running to stand still all the way to Christmas (not aided by some ‘organised power cuts’, courtesy of the local Pennine lumber industry). 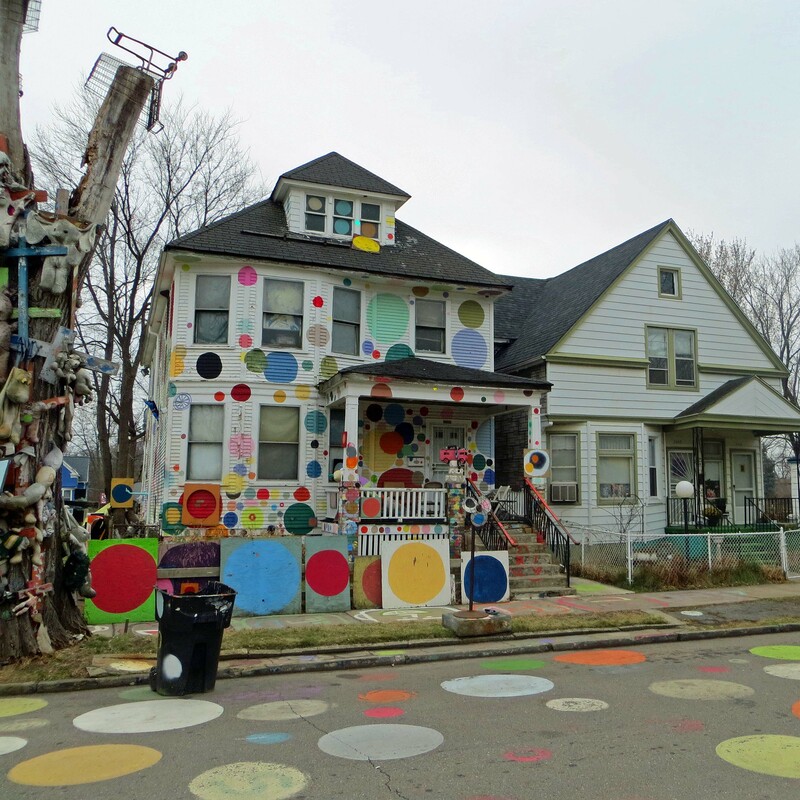 However, I have been thinking of my readers, whose support I appreciate so much, while trying hard to find time to do justice to what became for me one of the outstanding experiences of 2014: my visit to Detroit. On my first trip to Michigan, at the end of September, I saw nothing of Detroit except the airport and some of the industrial hinterland that lines the motorway en route to Ann Arbor. But, in December, my day-job meetings took place on Wednesday – Friday instead of Monday – Wednesday, so my hosts kindly offered me the opportunity to stay for the weekend in order to explore Michigan a little more. I’m particularly indebted to Jacqui, who generously gave up her Saturday to show Detroit to me and two colleagues. I have some very hazy childhood memories of television coverage of the race riots that took place in the USA in the 1960s. The one that sticks out was that in Birmingham, Alabama – I remember the newscasters of the day enunciating the two words, always with the emphasis on the second, as if Alabama had only a secondary right to the name ‘Birmingham’. The others seemed to blend into a sense of unrest across the States and the person of Martin Luther King became more vividly real to me than the places where riots occurred. I don’t remember – or perhaps never knew – that there were serious riots in Detroit as well. There, in 1967, more than forty people were killed, hundreds were injured and thousands of properties were destroyed by fire. Detroit was, of course, home to the American automobile industry. Henry Ford set up his headquarters there and inhabited a huge mansion in the city. Scores of other motor companies had factories and offices there and many famous marques were included among their number: Chrysler, Chevrolet, Oldsmobile, Pontiac and Studebaker-Packard are just some of the ones that I recognise. The race riots didn’t destroy what had been a flourishing motor-car industry, but they certainly pitched it into what became a very steep decline. This was accelerated, no doubt, by the simultaneous rise of its Japanese competitors, but essentially Detroit was a city that inflicted life-changing wounds upon itself. 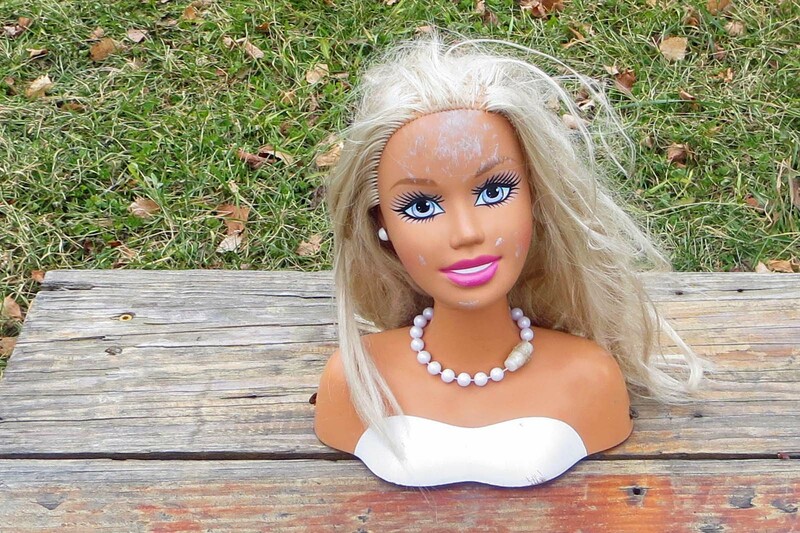 The wounds themselves can still be seen today. 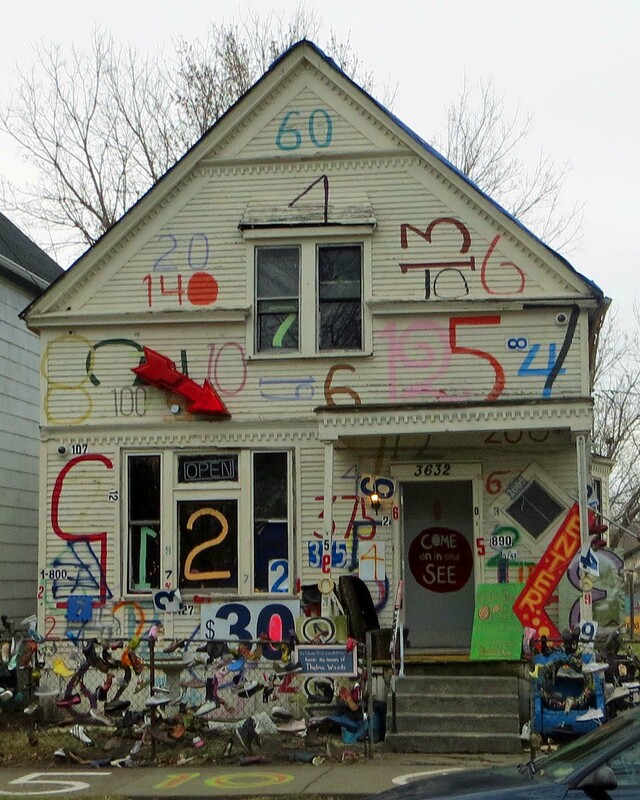 It is no exaggeration to say that Detroit is one of the most extraordinary places I have ever visited. As you approach the city from the west, you suddenly notice that some of the houses perched on the bank above the motorway have holes in their roofs. Some of the roofs are actually caving in, or the porches to the front or sides of the houses are leaning at drunken angles, in the process of breaking away from the main structure. At first, you may think that you’re just driving through a neighbourhood that’s being redeveloped and (although some of the houses are huge and were obviously once lovely old clapboard homes) assume some kind of slum clearance is taking place. 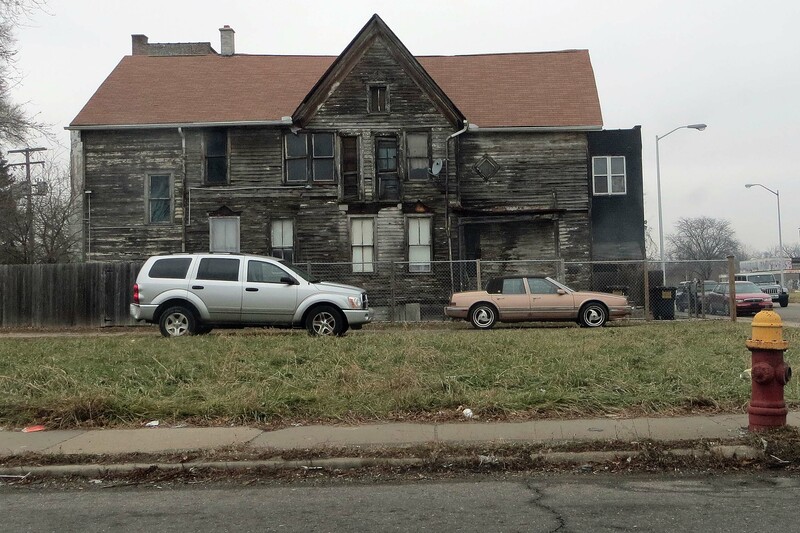 As this continues for mile after mile, it gradually dawns that this IS Detroit: it’s what the city looks like, or, to use a currently popular expression in a less usual context, this is ‘who Detroit is’. These houses were abandoned in the aftermath of the race riots and they have been left ever since as they were when their owners fled. Some are still owned by the families who vacated them or by their descendants; the legal owners of others can no longer be traced. 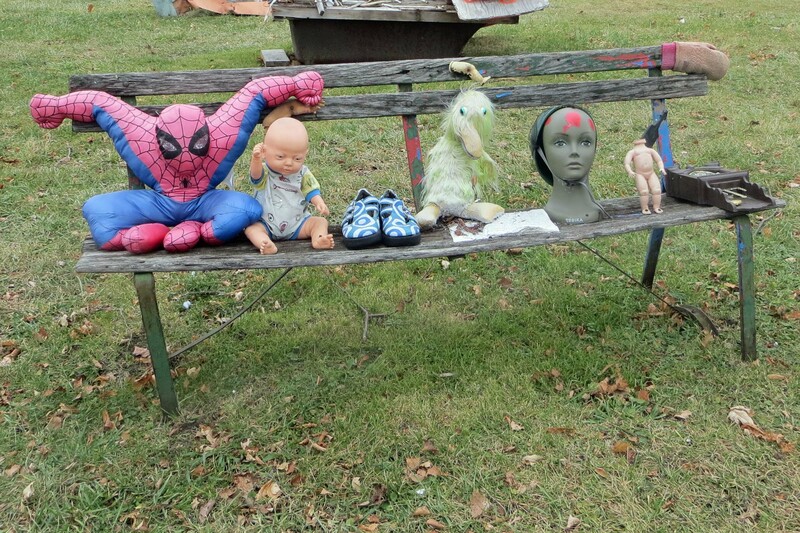 Some are occupied by squatters or used as crack dens. In some areas, the buildings are being bought up by developers, but it is a slow process. Detroit was bankrupt for very many years (by a wonderful coincidence, it actually emerged from bankruptcy during the week of my visit) and it is only latterly that the municipal authorities have begun in earnest to reinvent the city. A major part of their strategy is to reduce its vast, sprawling conurbation to a more manageable size, but this is a challenging task: many a street contains half a dozen proudly-owned and beautifully-maintained houses interspersed with two or three derelict ones. They lurk like ghouls at a wedding, their windows blind and broken, their beams and rafters exposed like bones peeking through flesh, their crooked limbs gradually causing them to sink to their knees, each one mocking the beauty of its own lost youth. The residents of the street go about their business almost oblivious of the existence of these stricken dwellings and certainly have no intention of moving out in order to oblige town planners by supporting logical but soulless schemes for making the city more compact. Yet there is also beauty to be found in the dereliction itself and, even where there is ugliness, rather than beauty, the ruins tell a fascinating tale. One man who recognised this early on was Tyree Guyton, a native of Detroit, who was twelve years old when the riots exploded. 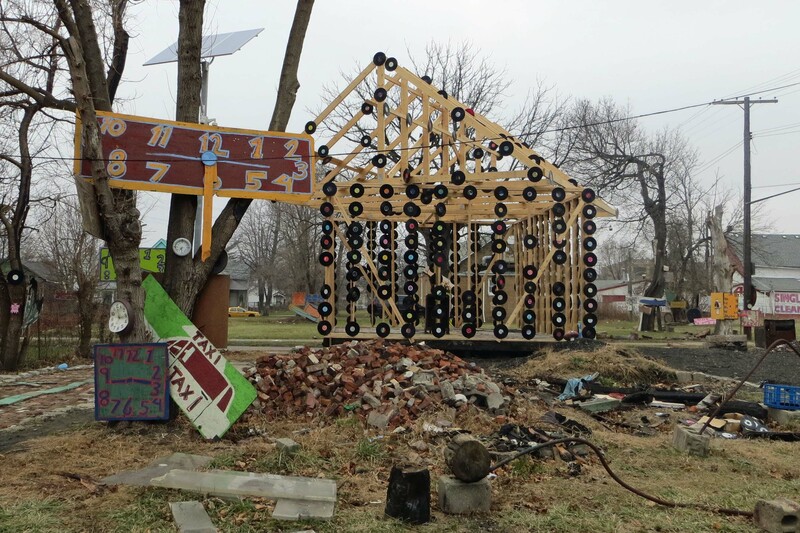 He decided to take an area of the city in which most of the buildings were derelict and create a series of art installations, using dwellings and objects recovered from them to tell the story of what happened there. 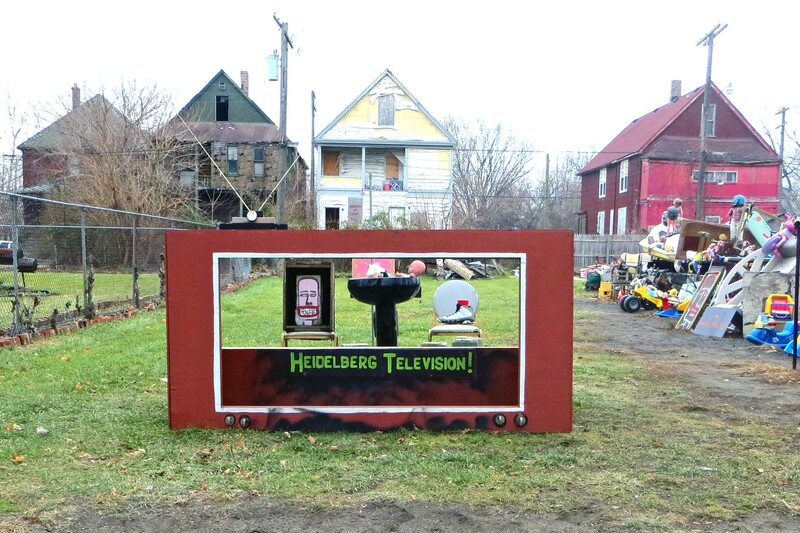 Now called The Heidelberg Project, it has gained international renown, though not without its own struggle: the municipal authorities twice destroyed the installations before they finally understood that Guyton was bringing hope and inspiration and a sense of identity to the broken and impoverished communities worst hit by Detroit’s decline. 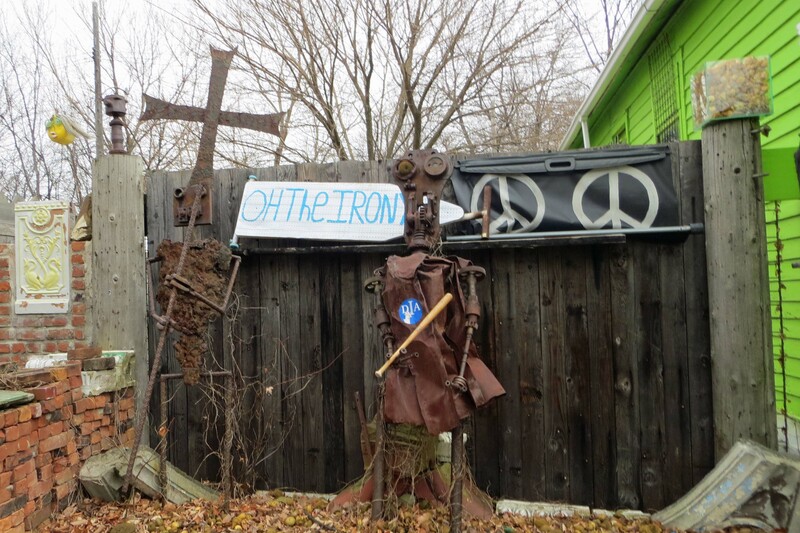 I’ve taken some photographs of the Heidelberg Project, which I’m proud to be able to share with my readers. However, because of the size and scope of the installations, no individual pictures can really do the whole project justice. 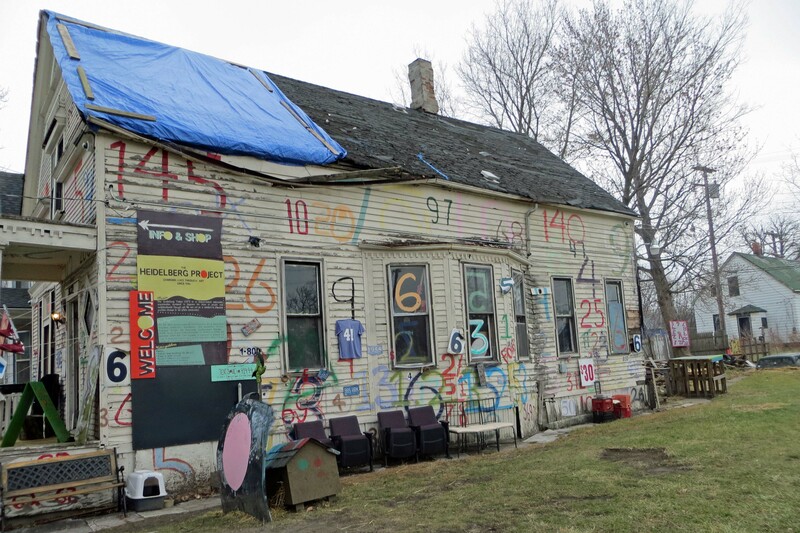 The Heidelberg Project is a living work of art: it changes continually. I have never seen anything quite like it, though it carries echoes and reverberations of many other kinds of art, and other tragedies captured by art, that I have been privileged to witness. The ways in which some of the buildings are decorated are reminiscent both of Gaudi and Hundertwasser. Some of the murals must have been inspired by Picasso. 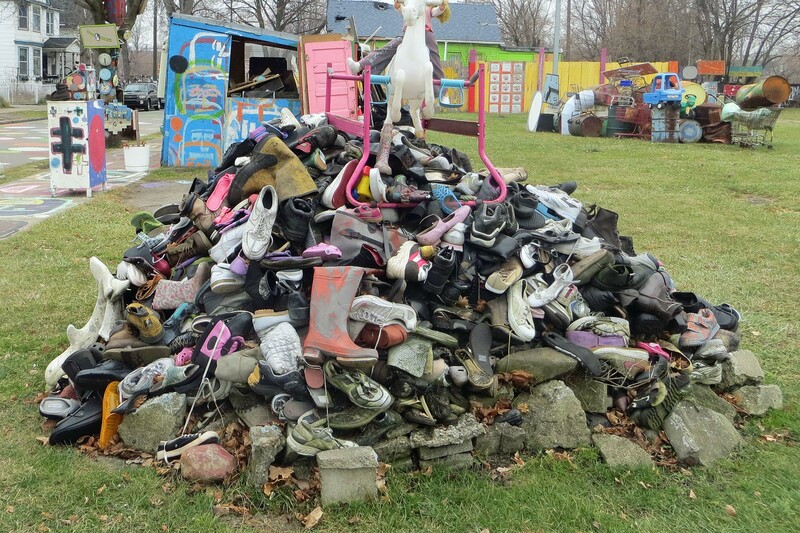 Most striking of all is the huge pile of shoes of all types and sizes that comprises one of the installations. I mean no disrespect when I say that immediately it reminded me of the glass case of shoes at Auschwitz. 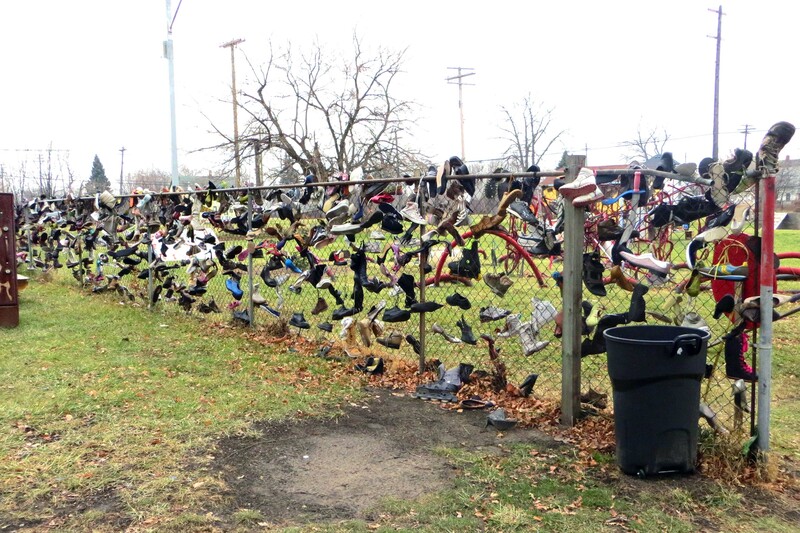 In many cases, the fates of the owners of the Detroit shoes will have been grim, though neither as harsh nor as hopeless as those of the Auschwitz victims: The Heidelberg Project is about renewal as well as remembrance. But no item of apparel is as evocative as the shoe: all of these shoes represent the journeyings of mankind; each of them is lost, discarded, stolen or defunct. The journey has gone on, or been cut short, without them. 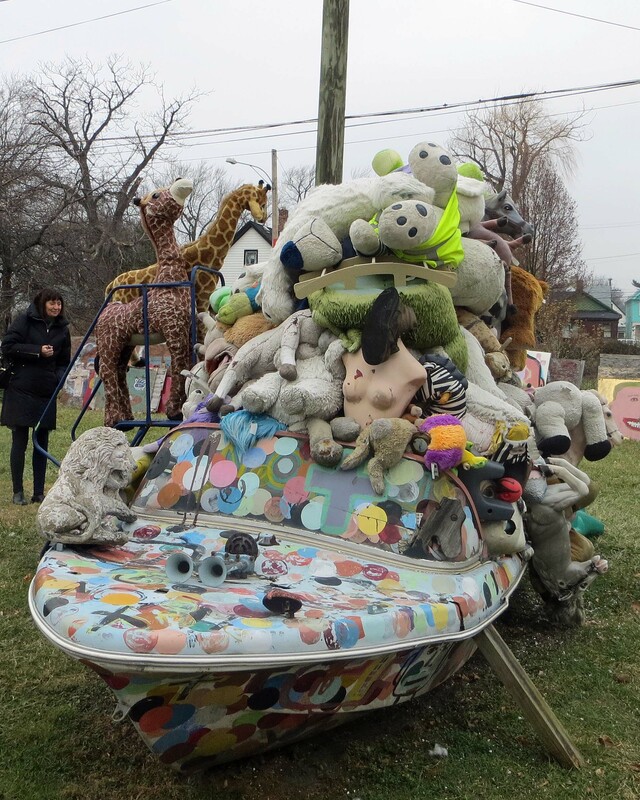 If you are ever in Detroit, I’d encourage you to visit The Heidelberg Project. I think it will transform, if not your life, then certainly the way in which you think about people, cities and regeneration. Take a peek at it here. Why all the polka dots? Tyree’s grandpa was fond of jellybeans; Tyree thought these looked like people, all similar, but different in colour, and he transposed them into dots celebrating colour, diversity and harmony. Magic! And despite what my tutor averred, I think that compiling a list is an excellent way of achieving literary distinction without having to try too hard. It allows its author to give free rein to his or her imagination without having to take on the full responsibility of plot, characterisation or format. 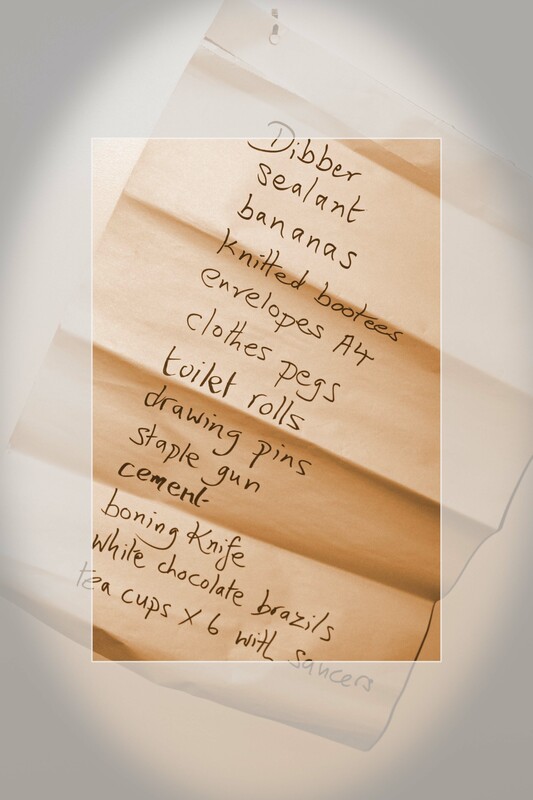 In order to create a list all you need to do is, as the saying goes, empty your head on to the paper. Though, with even half an eye on prosperity, you’re likely to want to tweak your list a little before you show it to anyone else. “Marvel not that I said unto thee, Ye must be born again. The wind bloweth where it listeth, and thou hearest the sound thereof, but canst not tell whence it cometh, and whither it goeth: so is every one that is born of the Spirit. Nicodemus answered and said unto him, ‘How can these things be?’”.